Drama in the blogosphere is just as pervasive as drama in high school. It lurks in the corners of the interwebs--beckoning you to get involved. Don't. Seriously-- stay out of it. You never know who's watching, and it can be a huge turnoff for brands to see you behaving like a character out of Mean Girls. My rule of thumb-- if I have to think twice about posting, it probably isn't a good idea. Keep it clean. This is the biggest of them all. Please, please, please, share posts from other bloggers within your niche. This is a major faux pas I see from far too many bloggers. As a general rule, I aim to keep a healthy ratio of my posts vs posts from other similar bloggers. And I always, always add their handle so they know I'm retweeting them. This helps me build relationships with bloggers within my niche, and sometimes, they even return the love. Always be willing to give more than you receive. You don't have to post 20 times a day, but keeping an active social media presence makes it easier for people to notice and keep up with you. It also makes it more likely that someone will stumble upon your blog- increasing your traffic in the process. There are some great automated tools to help with this--Hootsuite and Buffer just to name a few. Do a little research to find out which options best fit your budget. This was a lesson I had to learn the hard way. The thing about blogging is it's not just enough to have a blog, you have to have an active social media presences. One of my biggest mistakes was attempting to be everywhere at once. This led to a major burnout. After nearly a year of debating, I finally cut the tethers on my Facebook Fanpage. It was a tough decision, but I ultimately decided that I couldn't keep up with Facebooks ever changing rules/pay-to-promote methods. With Instagram taking the forefront of the top sources of blog referrals, I decided to let Facebook go and dedicate my time to Instagram. In the month since I returned from my hiatus, I've gained 500+ Instagram followers. It has taken A LOT of work, but I'm pretty happy with the results. Are you using photos from other bloggers without giving them credit? This is the ultimate no-no. It's almost akin to going into someones home, sleeping in their bed, eating their food, and then waltzing off without thanking them. Not only is it illegal, but it's just plain rude. As bloggers, we spend an absurd amount of time creating and editing photos to help tell a story, if you'd like to use one of our pictures, just give us a shout out. You'll earn more friends by giving us credit then you will by trying to pass of others content as your own. What do you think of these social media rules? Do you have any that you would add to this list? Excellent tips, Reese. It helped a lot. Having started my blogging journey just last month, this couldn't have come at a better time for me. With my blog up and running, I was thinking of making accounts on all the popular social media accounts which will complement my blog and thought I could easily manage them. But your point about the same through your experience has forced me to put my thinking cap back again to decide whether I would be able to manage so much at one time or not. So happy you found these useful! Shoot me an email if you have any more questions! 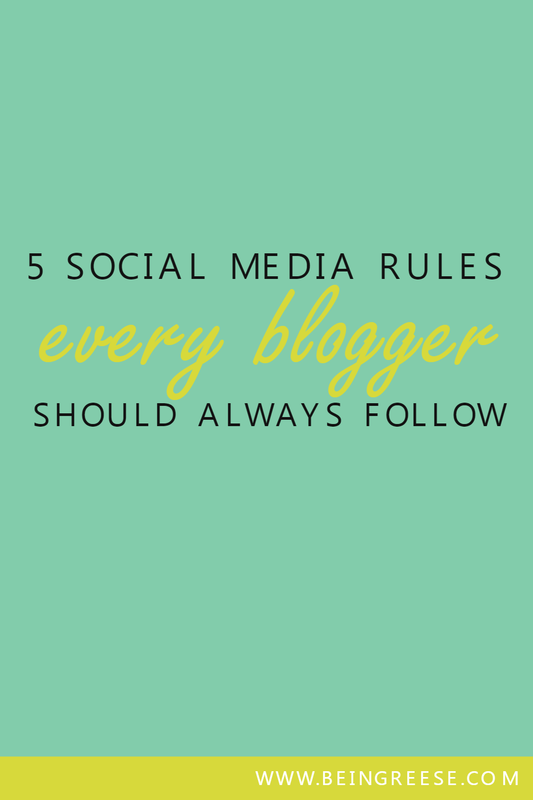 Solid suggestions for any blogger who wants to manage his/her social media interactions well. I'm particularly impressed with "Give More Than You Receive" suggestion. From my own experience of running a blog since the last 3 years, I too have noticed that most bloggers hardly share the nice works of other fellow bloggers on their social networks. Blogging is all about building relationships... at least to me. Unfortunately, most of the folks just go by what is obvious to them and care only about their own blog, completely ignoring the fact that the more they will promote other bloggers' works, the better it will be for their own blog in the long term. Don't you agree with that, Reese? I definitely agree! Thanks for leaving your thoughts! I'm so happy you found this helpful! Such good information here! I need to be better at some of these. Don't worry Bianca, there's about a thousand other things I could do better at as well. It just takes time! Thanks for stopping by!